I was born in 1948 and I grew up in the centre of London, for me it is still a very important part of what I do and what excites me. I can remember buying my first tubes of oil paint when I was about 15 year old in our local art shop in Hampstead, I thought this is really easy being an artist especially when I sold my first painting, but actually it took me many years to find my way. I have been interested in classic cars and classic motor sport since my first visit to Brighton Speed trials in 1968, it's remarkable that the cars I was fascinated in then are still around today , which is part of what I find interesting. I still paint landscape and London street scenes, but my main interest is in the classic car scene. 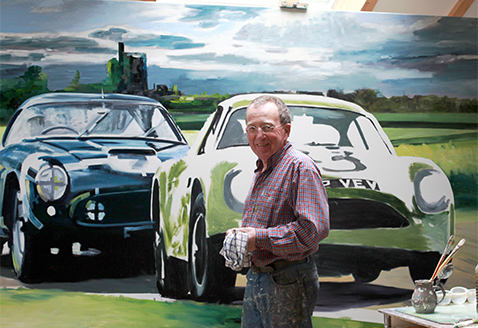 My paintings are often large, the compositions that I prefer often include people and objects that accompany these beautiful cars to create a narrative or to convey a story, either off the present day or can be of a historical setting of many years ago. Apart from a recent commission that is on wood panel, all my work is oil paint on canvas. I have no interest in making or selling prints of my work, all my paintings are original. A huge amount of my time is used to research and work out a composition , and it is very important for me that the finished painting shows a workmanship and quality that my clients expect from my work. The smell of the oil paint and the touch of the brush marks are part of what I enjoy , and are an important factor to make each painting unique. Please fill in this form to get in touch with me, your information will not be used for anything other than our communication.